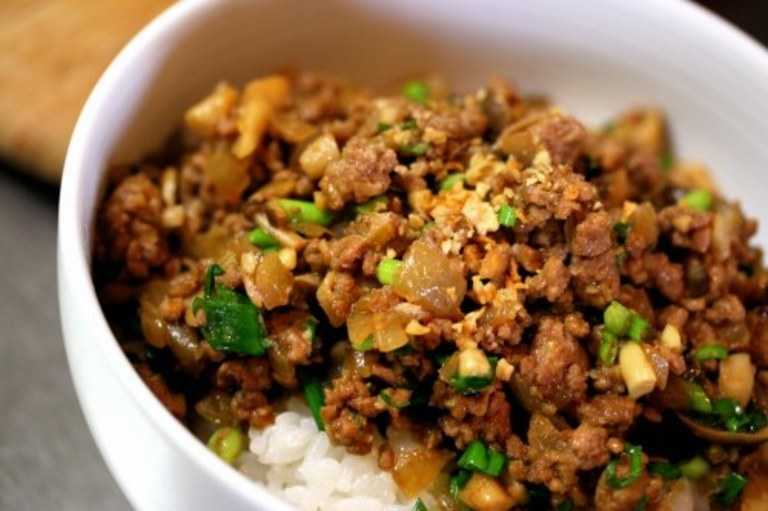 "Tori Soboro" is a Japanese dish made with minced chicken. This is a South Asian-influenced version, made with pork. It is a comforting, sweet-savoury dish that is best served simply on top of steaming white rice. I'll admit that this is a dish I threw together mostly out of pantry ingredients...but it turned out tasty :) Makes 2 portions. 1. Fry together the pork, ginger and garlic in a wok with a little oil. Add a splash of mirin, a glug of kecap manis and chilli sauce, and a liberal dousing of maggi seasoning. 2. Add the chopped shimeji mushrooms (you can substitute another variety of asian mushroom if you cannot get shimeji). Move around the wok until the meat is cooked through. 3. Turn the heat off. Stir through the chopped spring onions and chopped peanuts. Drizzle a little sesame oil, season generously with white pepper and give everything a good stir. Heap onto bowls of rice.